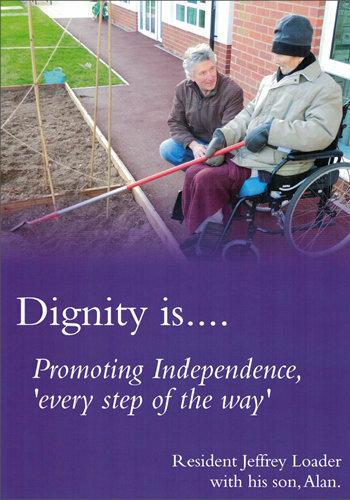 According to the Social Care Institute for Excellence, Dignity is a state, quality or manner worthy of esteem or respect; and (by extension) self-respect. Dignity in care, therefore, means the kind of care which supports and promotes, and does not undermine a person's self-respect regardless of any difference. ​What is clear is that people know when they have not been treated with Dignity. Dignity is concerned with how people feel, think and behave in relation to the worth or value of themselves and others. Dignified care, or the lack of it, can have a profound effect on people’s well-being. At Runwood Homes we take the Dignity of our residents very seriously, understanding how important it is that everyone deserves to be treated with individuality, respect, and consideration, that’s why our company philosophy is ‘Dignity for Everyone, Everyday’. Dignity is the result of being treated with respect. It is internal to each individual, and is often associated with a sense of worth, well-being or a sense of purpose. Research indicates that there are eight main factors that promote Dignity in care. Each of these Dignity Factors contributes to a person's sense of self respect, and they should all be present in care. 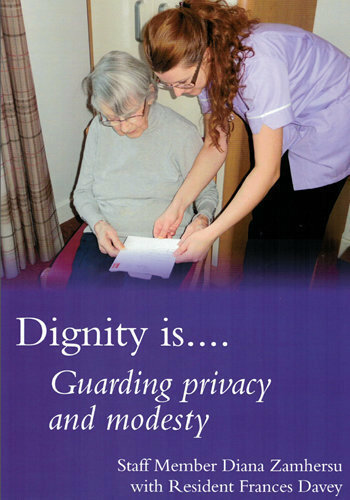 How Do We Ensure Dignified Care at All Times? Dignity is a very high priority to us, and our staff aim to treat the residents of our home as they themselves would expect to be treated. All our staff are trained to understand how to provide Dignified Care and are monitored by their leaders, who will expect the highest standards of respect, privacy and individual choice. 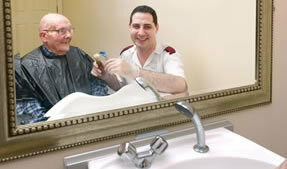 To support our staff in giving the highest level of dignified care, there are a number of initiatives in place. Dementia Specialist (Dementia Services Manager): Each home has a Dementia Specialist who supports, guides and develops a group of homes to provide the best care and support to people living with Dementia. They also regularly assess homes against our rigorous standards to ensure residents are treated with the Dignity they and their families expect. Where there are areas for improvement, they will work closely alongside the team, to coach and demonstrate what we are looking for. 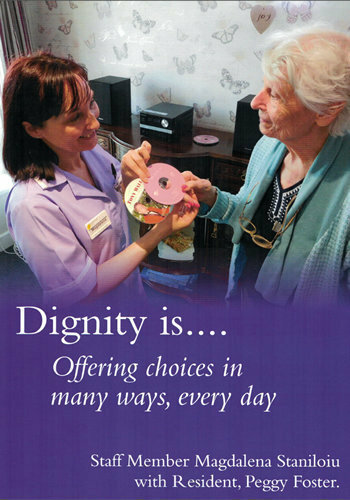 Dignity Display: In every home’s reception there is a free standing Dignity Display, which explains what the Dignity theme of the month is. Themes include Dignity in involving Families and Friends, Dignity in Social Inclusion, and Dignity in Relationships. Dignity Tree: In every home there is a unique ‘Dignity Tree’ (Dignity for everyone, every day), which is designed and created by staff and residents. It has numerous quotes from staff and residents who together have described what Dignity means to them. Dignity Focus group: each home is developing a group of staff from different departments, whose aim is to focus on Dignity and Dementia, and who will lead on developments to promote quality of life for residents. 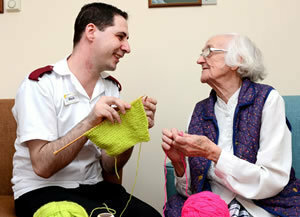 They meet regularly, and work closely with the Dementia Services Manager for their home.